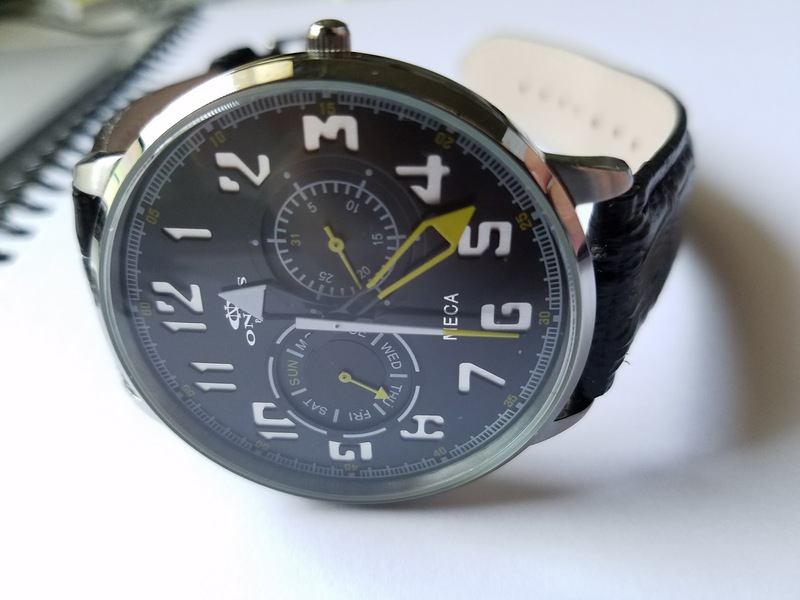 This is a review of the Oniss "Meca" Stainless Steel & Leather Sport Watch that I received due to my membership in Watchgang. It's a bold watch design with an interesting style that some folks like and some don't. The watch features a Japanese quartz movement. The design of the Oniss "Meca" watch features large readable hands for hours, minutes, and seconds, large numerals, and two large sub-dials that dominate the face of the watch. 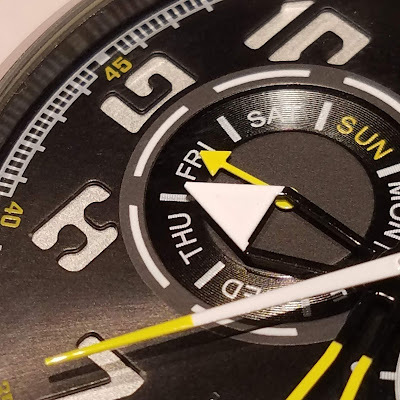 One sub-dial provides the day of the week and the other provides the day of the month on a 31-day calendar. The hour numerals initially appear to be the typical chromed numerals that are featured on many watches. However, on closer examination, the numbers are cut into the dial itself and reveal an underlying chromed plate. It's an interesting design feature and a rich touch, but it doesn't serve to make the numerals more readable. In contrast, the watch hands are supremely readable and I really like following the march of the bright second hand. This watch dial is protected by a mineral crystal which is slightly convex. It feels like real glass, but can show a bit of glare from some angles. I believe it gives the watch a bit of vintage flair. The Oniss "Meca" watch also has a few features that you would expect in a high end watch like etching on the clasp and caseback. 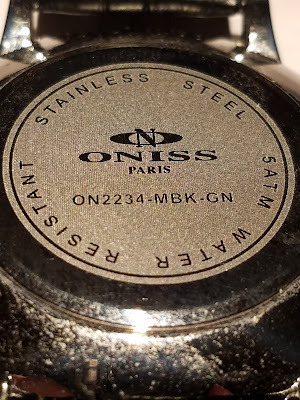 The Oniss "Meca" has some features that are expected in a high end watch. For example, this sports watch has a stainless steel case and is water resistant to 5 Atmospheres (50 Meters or 164 Feet). However, to me, the stainless steel case seems very light and thin. I think the case quality seems more akin to a cheap Chinese watch than a luxury European-style timepiece. The watch does come with a genuine leather strap with a typical crocodile pattern. According to the Amazon description, the Oniss "Meca" sport watch has a 45 millimeter case that is 11 millimeters thick. 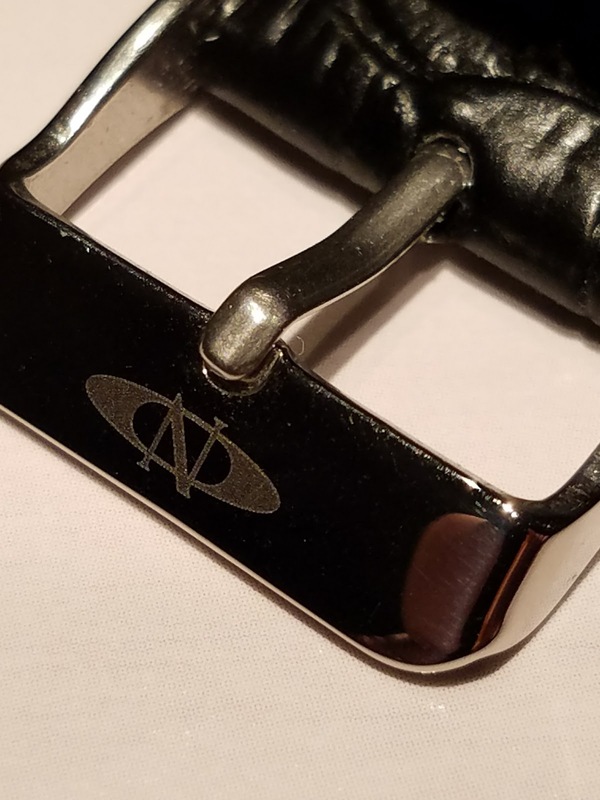 The strap is 22 millimeters wide. As previously noted, the watch has a very lightweight stainless steel case. While it may not give it the heft of a luxury timepiece, it certainly makes the Meca a comfortable lightweight watch to wear. In my opinion, this watch has winning proportions. The Oniss "Meca" is a challenge to review. People offer opinions on it. My wife says it "looks cheap" and compares it to watches that are typically found at Target or Walmart. I think it's definitely better than a discount store watch. The watch also draws compliments. For example, the barista dude at my local Starbucks said--"Cool watch man"--when I paid for late night refreshments at the drive through. As a dude, I find much to like about the "Meca." It has the look of a sports car driver's watch. The big sub-dials are classic. It's a great "bang around" watch for casual wear. However, it doesn't look quite high end enough to support my aspirations in a professional office setting. 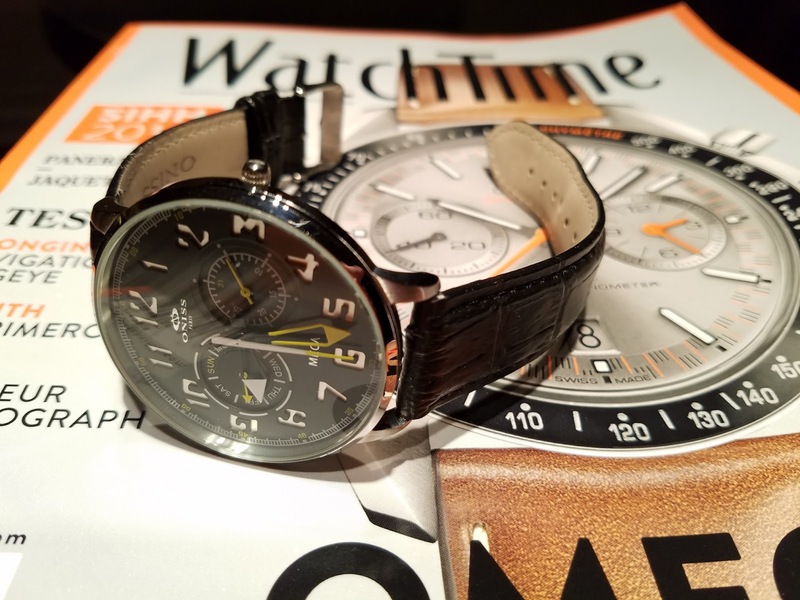 In some respects, it is unfair for me to compare this Oniss watch to the higher end timepieces that one might see in a horological magazine like WatchTime. All of the watches that I recently read about in that publication cost in excess of $1000. I do appreciate good looking quartz alternatives that come in at affordable price points. Given the price of my WatchGang membership, this watch is coming in at around $50. It offers a great look, but it feels like a watch that is worth $50 to $100. Overall, I really do like the Oniss "Meca" and I wear it a lot. But, at a minimum, I think it needs a more substantial case to come into the office. Good to know about this.It looks amazing.If you are looking for mens luxury watches for sale california , visit hillstwatchco.com. 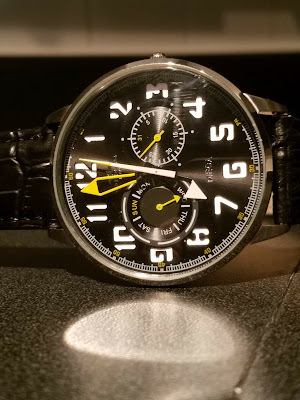 Beautiful watches!I am really thankful to you for sharing this blog with us.If you want accessories to wear with watches, visit coenanders.com.